Where a standard product does not exactly meet the requirements of a given application then Tappex® may already have stock of a special variation that is suitable. For significantly large order quantities, inserts can often be produced as ‘Specials’ to the customer’s requirements. For advice, please contact our applications department with your specific requirements. Typically, variations will be in the length, oversize body (i.e. M5 in an M6 body) or head dimensions; occasionally other changes to geometry can be considered – contact Tappex® sales office for further advice. 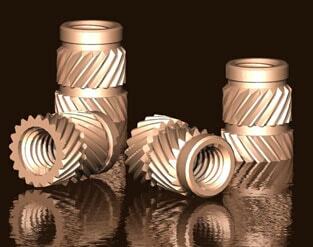 The Tappex Dedsert® range of inserts is suitable for heat or ultrasonic installation into thermoplastic materials. The Dedsert® design, see image, includes two bands of helical knurling with left and right helix, undercuts and a pilot to assist with insert location. Particularly suitable where high load capacity is required, the two bands of opposed helical knurling offer a good combination of rotational and pull out performance. 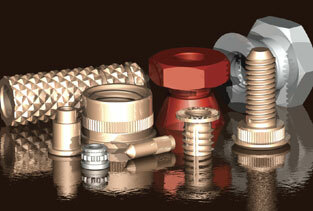 The Dedsert® is initially available unheaded but may be manufactured headed or with a male thread. High rotational and pull out performance. Rapid heat or ultrasonic installation. Short series and headed variants made to customer order. Pilot provides a means of alignment with the receiving hole. The part number is defined 101 for regular and 102 for short length unheaded and 171 for reduced headed, followed by the thread size. Currently the range is limited, please contact us with your requirements. Available as a single and double ended brass insert for press fitting into harder or filled grades of thermoplastic and thermoset materials, designed to optimise high volume applications where automatic feed equipment is justified. Please contact us to discuss availability. A double ended brass insert designed for heat insertion only, the curved knurl form makes it most suitable for stress prone thermoplastic materials. Please contact us to discuss availability.